Fit Wanderlust Runner: April Review + 5 Workout Songs to Add to Your Playlist! April Review + 5 Workout Songs to Add to Your Playlist! So you see, this is why my month didn't really end the way I was hoping it would. To be honest, it kind of just took me by surprise. I wish I could say I am 100% better, but I'm not. The main thing that has helped me with all this has been my running. If all of this would have happened when I still had stitches on my knee, I don't know how I would have dealt with it. So now I begin the healing process once again. I just wish there was a magic wand that would take away all the pain and sadness. But I am determined to get past this little hump and be grateful for all the great things in my life. So enough of all this sadness! Here are some of favorite things for the month of April plus five songs to add to your playlist. Total Miles for April: 56.2 Not too bad considering I had to take 10 days off due to my stitches. I ended the month with two 8 mile runs with a good pace. I have a month left until my next race and I feel pretty confident that I will do just fine! Favorite Run: I guess I would have to say it was my last 8 mile run. It was the day after my meltdown so I had a lot to let out. I took out all my aggression on the pavement. 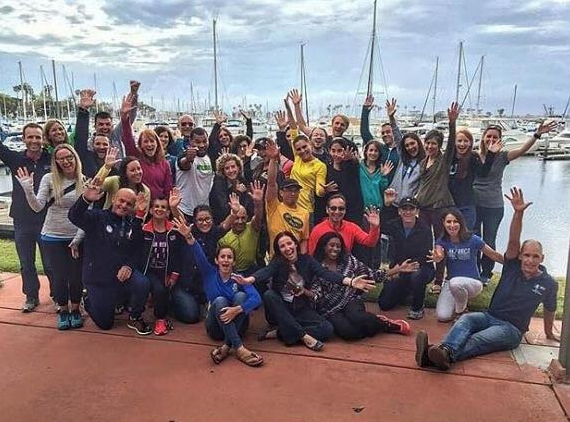 Favorite Experience: I was so happy to attend the Running Coach Certification Course in my lovely city. Hopefully soon I can say I am an official running coach! Favorite Moment: I went to work a few weeks ago and received the most heart warming present. A sweet wonderful family came to my department and dropped off a present for me. I was so incredibly touched. I apparently made an impact in their lives which just made my day! Best News: Getting the email with my confirmation to the Chicago Marathon!! Great song choices - I've been loving that Meghan Trainor song lately too - it's so fun!